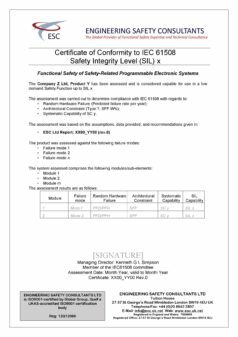 The assessment is made with the specific safety application in mind, and where successful, a certificate stating the SIL capability of the device / product / system intended to be used in the safety application can be issued, in line with the expectations of IEC 61508. Full compliance with the requirements of IEC 61508 for product certification can only be claimed when all aspects are considered (hardware, architectural and systematic capability). Where the focus is on the reliability of the product or system then, random hardware requirements’ and ‘architectural constraints’ should be considered, as a minimum. A list of our issued certificates can be found here in our Product Certificate Database with a copy of the certificate to download.